The in­stru­ment for de­vi­ding the co­ax ca­ble in­to parts costs just 2.20 $. T ty­pe con­nec­tor con­tain­ing 2 an­ten­nas and 1 TV costs just 6.28 $. This antenna represents three squares - director, the driven element which is a folded dipole ant the reflector, which are located in one guide. It is suitable for reception of far signals DVB-T2. Nowadays it is the most popular antenna construction for making yourself. The power gain of this three-element loop antenna is 14-15 Db. The author managed to receive the signal of decimetral range from Ostankino Tower being in 65 km from it. 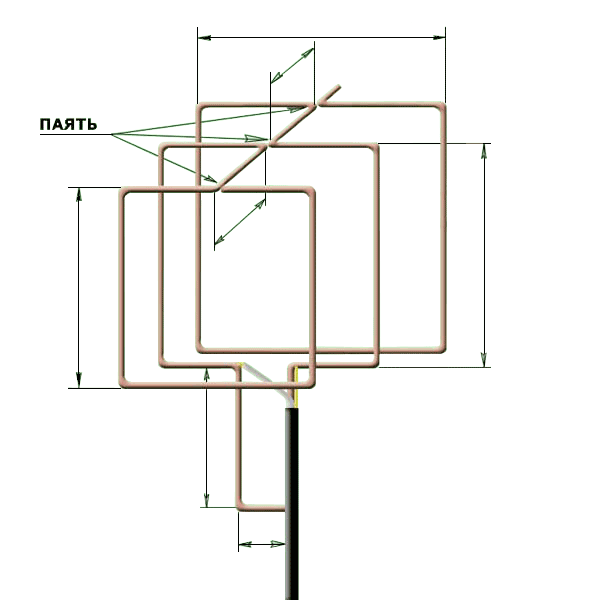 Sotnikov said that its up and bottom sides work as phased lattice consisting of three-element Yagi antennas.